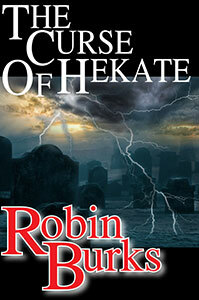 Robin Burks | Get The Curse Of Hekate Now! Get The Curse Of Hekate Now! In case you haven’t noticed, it’s official: you can now purchase The Curse Of Hekate everywhere digital books are sold. So be sure to stop by your favorite digital book retailer (see links below) and pick up a copy. And if you haven’t yet read Zeus, Inc., you can also pick that up now for just 99 cents. Even better? Over the weekend, The Curse Of Hekate made the Top 50 list for Kindle books about mythology. How cool is that? Let’s keep it on there, shall we? So please go buy a copy now. And once you’ve read it, please leave a review on one or all of these sites, please.